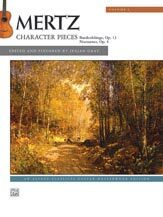 This edition of Mertz's character pieces includes 28 pieces from Bardenklänge, Op. 13, as well as Trois Nocturnes, Op. 4. Mertz's most important body of work was Bardenklänge, which features many small but delightful pieces. Included here are often-performed works like "Liebeslied," "Tarantelle," "An Malvina," and "Romanze," which clearly affirm Mertz's places as the guitar's principal German Romantic composer. The attractive Three Nocturnes, Op. 4 are popular recital pieces and will be a great addition to your repertoire. This masterwork edition features thoughtful, expert fingerings by respected performer and pedagogue Julian Gray. It is a must-have for any serious classical guitarist. Titles: Bardenklänge, Op. 13 * An Malvina (To Malvina) * Romanze * Abendlied (Evening Song) * Unruhe (Restlessness) * Elfenreigen (Dance of the Elves) * An die Entfernte (To the Distant One) * Etude * Capriccio * Gondoliera * Liebeslied (Love Song) * Fingals-Höhle (Fingal’s Cave) * Gebeth (Prayer) * Tarantelle * Variations mignonnes * Kindermärchen (Children’s Fairy Tale) * Rondino * Romanze * Scherzo * Sehnsucht (Longing) * Lied ohne Worte (Song without Words) * Mazurka * Polonaises Favorites 1, 2, 3 & 4 * Polonaises Favorites 4, 5 & 6 * Trois Nocturnes, Op. 4.